Chrome isn’t Chrome without the cool and nifty extensions that help you get the most of the browser experience. But this very fact can also be exploited by malicious coders to intrude on your PC and personal info. Well, the researchers over at security firm ICEBRG identified 4 malicious extensions, with a total of about 500k downloads, by observing an unexpected spike in outbound traffic volume from a customer’s computer. They backtracked the requests the extensions were sending through the browsers to pinpoint what all extensions were acting out of line. 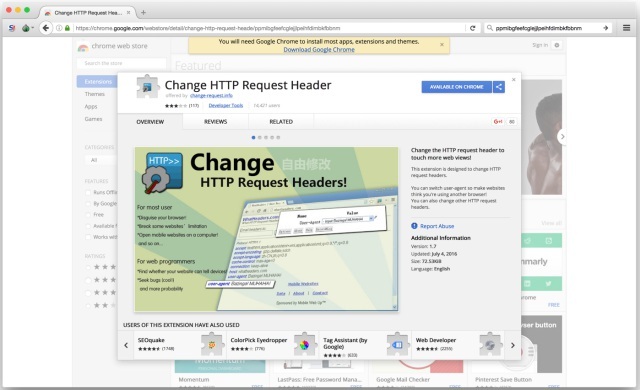 This hunt led the researchers to the first malicious extension, an extension called Change HTTP Request Header. The other three extensions uncovered to be a part of the malicious activity were Nyoogle, Stickies, and Lite Bookmarks. They suspect that these extensions were part of a “click-fraud scam”, which provided the intruders with monetary gains based on the total number of clicks. All the infected extensions, reported privately by ICEBRG have now been removed from the Chrome Web Store. They also reported the malicious extensions to both the National Cyber Security Centre in the Netherlands and the US-CERT. With the insistent reports of new malicious programs trying to infect the computers, it has become increasingly essential for tech giants to strictly enforce cyber-security features into their software. Chrome is touted to be one of the most secure browsers but as you can see it is also not completely free from the reach of intruders. So, if you’d any of the extensions downloaded on your browser, I’d suggest you perform a clean install.